The SE model weighs about 3,200 lbs and the 2.5L 170-hp (177 lb-ft torque) inline-5 does the job well of getting the SportWagen onto the freeway without any drama. Flooring it, the engine winds up a bit before the torque and power translate into forward acceleration. VW gives a figure of 8.7 seconds for 0-60 mph which is okay, but compared to other cars in its price range, it’s a little slow. Vented discs in front and solid discs out back prove their mettle in stopping the stretched Jetta smoothly. An interesting comparison would be the SEL with the 2.0T engine with another 30-hp and 30-lb/ft. VW says the SEL is almost 2-seconds faster. The steering is responsive and provided the perfect feedback. In fact, it’s possibly one of the best attributes of this Jetta. Wow, maybe the SportWagen does live up to its tagline, “The wagon that thinks it’s a sports car.” Despite the wide 225/45-17 ContiPro Contacts, the steering affords the driver a precision found in more expensive sports cars. It’s not as good as a 3-series BMW, but it’s about 70-80% as good. I took the car up the coast to Gualala (a small coastal town north of Bodega Bay) over the weekend, driving a long stretch on curvy, Highway 1. It was fun navigating the twists and turns as the electro-mechanical steering system is perfectly weighted. Well done, V-dub! The chrome bumper cover on the front is a bit gimmicky, but the overall styling is muted. The lines are smooth with amorphous curves and nothing that causes the car to stand out. From the rear I was reminded of the Ford Focus hatchback. However, looking at the rear quarter panel from the side aft of the wheel well, the light cluster design reminded me of a late model Mercedes wagon, which in my opinion, made the VW “look” more expensive than it is. The integrated turn signals in the side view mirror continue that added elegance for the VW. Overall, Volkswagen designers have succeeded in evolving the SportWagen into a desirable shape that mixes elegance with simplicity. Stickering at $24.1k, the VW is in the same league as the Chevy HHR SS that I last tested. 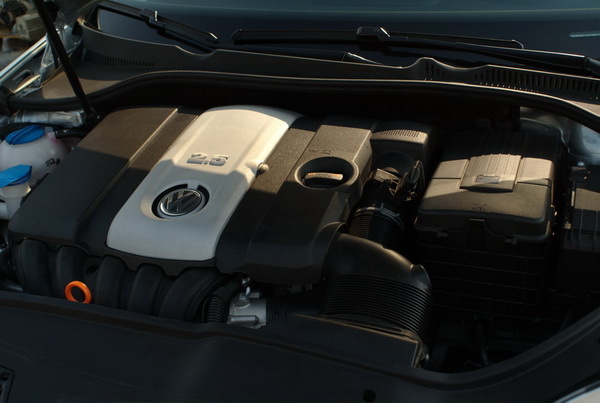 The SportWagen has a smoother transmission and is more refined, but you get almost a hundred extra hp with the SS, and similar interior space. If I had to choose, I would spend the extra $500 and get the Chevy … despite the turbo lag, there’s nothing like having 260hp at your disposal combined with a go kart-like steering system. Big grins all around! What about its cousin from the Audi family? 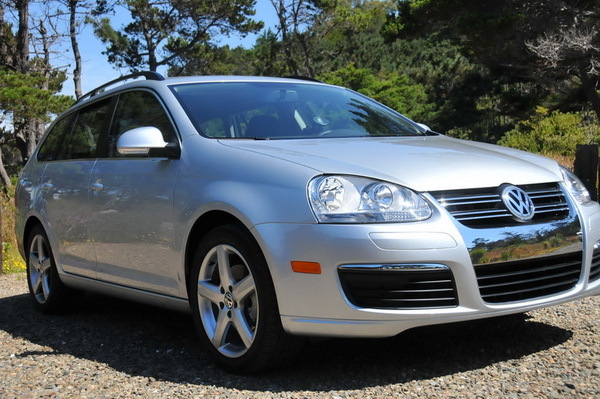 If you couldn’t afford an A3, you’d get something close with the VW while saving several thousands of dollars. For something else with the same utility, you could look at the RAV4, CR-V or Forester. 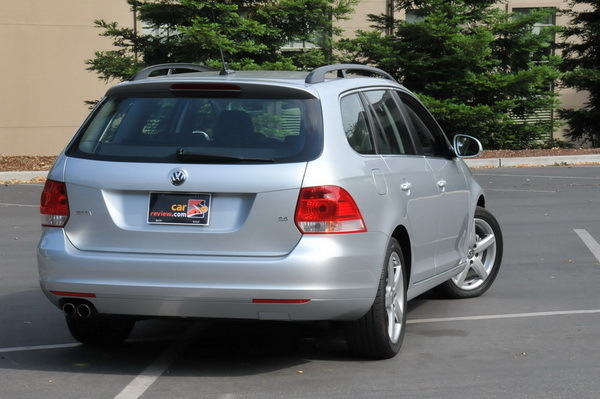 If you’re looking for a car that’s easy to drive, has decent gas mileage, and a multitude of utility value (our test car had factory roof rails), the Jetta SportWagen is a great choice. Over a distance of 389 miles, I averaged 26.2 mpg over mostly conservative, highway driving with the gas warning light illuminating at 340 miles. Not bad. One could easily load up the vehicle and take this wagon for a multi-week trip. Its smooth engine and great steering add to the pleasurable driving experience. For $24k, it’s a solid choice and at least worth checking out before making a decision. What a good looking vehicle. For many of us it will be a few years before we get behind the wheel of one though as we can’t all afford to buy new but, looking at his one it may be a contender to replace my Bora V6 4 Motion at some time in the future.